SAN JUAN COUNTY – A sixth person has died after a head-on collision Sunday on state Route 191, mile post 81, in San Juan County and authorities have released the names of the victims. The fatal victims occupying the Chrysler Town and Country van were Samantha Blueeyes (driver), 23; Alfreda A. Bowman, 28; Michael A. Blueeyes, 22; and Esmerelda Velasquez, 11 – all of Salt Lake City. The single survivor was Travis L. Howland, 24, also of Salt Lake City. The occupants of the Chrysler Crossfire sports car were Cody R. Farrabee (driver), 22, of Queen Creek, Arizona, and Rheana Hazel, 23, of Las Vegas. 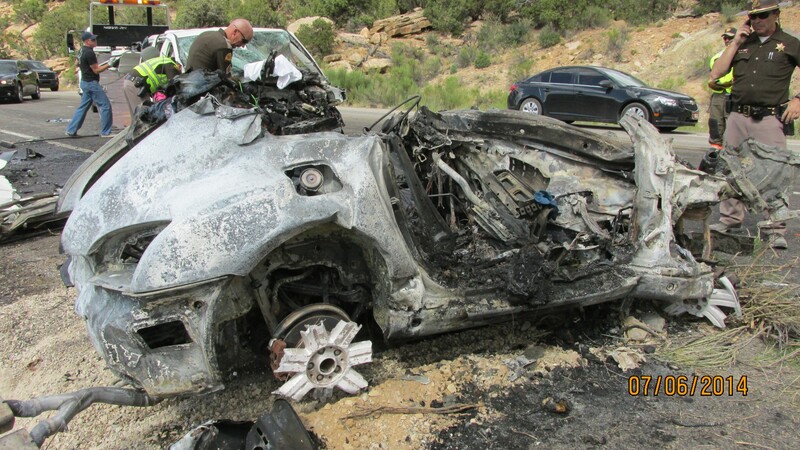 The collision occurred on Peters Hill about 13 miles north of Monticello when a van with five occupants traveling northbound made a bad pass, and crashed head on into a sports car with two occupants headed southbound, Utah Highway Patrol Trooper Evan Kirby said. The two occupants of the burned sports car were unable to exit the vehicle and died.